NMM 9018. 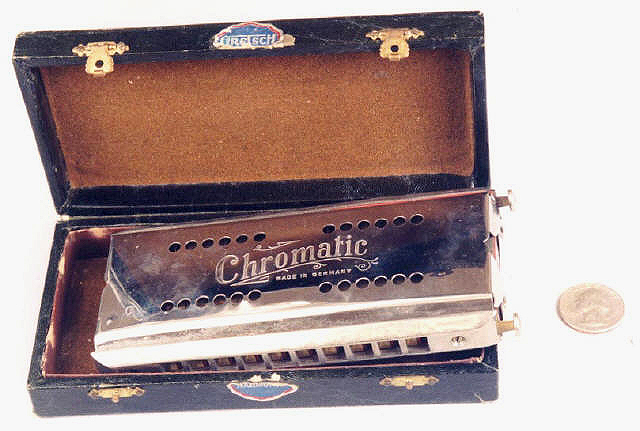 Chromatic harmonica by Gretsch, Germany, after 1930. This double-sided chromatic harmonica in C and G was a short-lived experiment. Most chromatic players became adept enough to play in any key on a C-tuned instrument, so a second key was unnecessary. After 10 years of searching for another example, Alan Bates concluded that this is the only double-sided chromatic harmonica known to exist. Alan G. Bates Collection, 2000.